This has been driving me crazy, the French over-use of the sound "sawn." I made the letter "n" in "sawn" smaller to represent the nasal "n" sound that is so often heard in French. It's like "dawn" but instead of using the tip of your tongue against the top-front of your upper palate to pronounce the letter "n" you pronounce it behind your nasal passages. Cent sens sans sent sang. According to Google Translate it means: "One hundred senses without the smell of blood." That is technically a meaningful sentence. Granted it's unlikely to be used, and when I flipped it back and forth between English and French translation it turned into "Une centaine de sens sans l'odeur du sang" which means "A hundred senses without the smell of blood." Which is damn close to the original sentence meaning in English. In print "Cent sens sans sent sang" looks like five distinct, if somewhat similar words. But you can easily see they are different words. Visually. Now this is why French, as spoken, is so hard for non-native speakers to understand. "sawn sawn sawn sawn sawn"
That's right, those five distinct words are pronounced exactly the same way. It's like the stereotypical French laugh "hohn hohn hohn" (see the French chef in The Little Mermaid for an example) but with an "s" in front of each "hohn." I mean, sure, English has plenty of homophones, but I can't think of any you can use to make a five-word sentence. And it's made worse by the fact that the French don't like to emphasize words when speaking sentences - they don't even like to emphasize syllables in a word, they try to make them all the same. Which is why French sounds like rat-a-tat-tat-tat. Here is an article about French homophones which rightfully complains about this particular one. And there are quite a few others. And don't even get me started on "le souris qui sourit" which means "the smiling mouse." 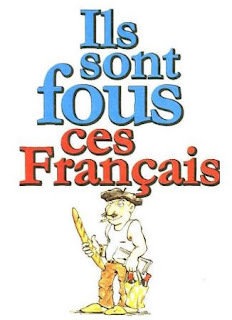 The main problem, in my opinion is the French often don't pronounce the last letter of their words. In English we can tell the difference between sis and sit because we pronounce the last freaking letter. But in French, souris and sourit both sound like soo-ree. And BTW - it's not soo-ree where you grit your teeth together to pronounce the "r" sounds. Instead you have to make this gargling sound in the back of your throat for the letter "r." The letter "r" is probably the worst for English speakers - it gives me a sore throat after speaking French for a few minutes. Ça me rend si fou!